The Honor View 20 is now available in India for purchase via Amazon. 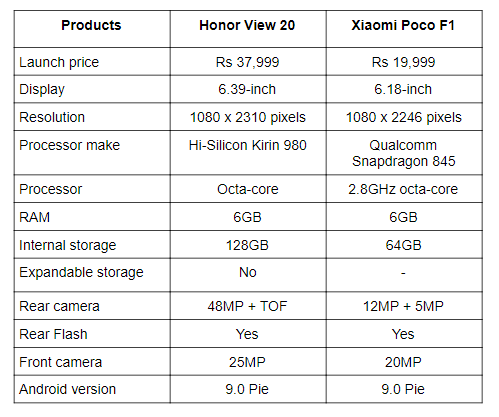 We are comparing it with Xiaomi’s popular device Poco F1. the comparison is based on specifications, features, and price. The Honor View 20 is the world’s first smartphone that comes with a 48MP sensor on the back along with a TOF 3D camera. The device is priced at Rs 37,999 in India and is now on sale at Amazon. On the other hand, we have the Xiaomi Poco F1, which gave a tough fight last year to a lot of premium devices. It has a dual camera set up on the back both and is powered by a Qualcomm Snapdragon 845 processor. So, let’s begin. 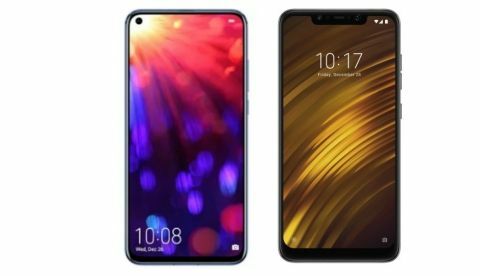 The Honor View 20 sports a bigger 6.39-inch display that offers a resolution of 1080 x 2310 pixels, while the Xiaomi Poco F1 features a slightly smaller 6.18-inch display that comes with a resolution of 1080 x 2246 pixels. The Honor View 20 is powered by a Kirin 980 octa-core processor, which is paired with 6GB RAM and 128GB internal memory. On the other side, the Xiaomi Poco F1 is backed by a Qualcomm Snapdragon 845 processor, which is coupled with 6GB RAM and 64GB internal memory. The Honor View 20 features a dual 48MP + TOF 3D camera setup on the back along with a 25MP sensor on the front. On the other side, the Xiaomi Poco F1 has a 12MP + 5MP dual camera setup on the back with a 20MP sensor on the front. The Honor View 20 is available on Amazon for Rs 37,999, while the Xiaomi Poco F1 is available for Rs 19,999 in India.